Holiday Adventures: Hawaii is rated 1.6 out of 5 by 23. Rated 4 out of 5 by pinkorchid from Not that Bad! After reading the reviews I decided to try the demo, and I did find it quite nice, relaxing, and very nice images and scenes. I would actually buy it if some of the issues were fixed, as others have mentioned! Perhaps there needs to be a non-timed option, the images or scenes do need to be clearer (although they were fine in the "Window" option"), and I didn't notice a way to gain hints or start the scene over if you are stuck? I thought the characters were very cute, but the captions are a bit simple (no real story line- but that's not bad), and while I did enjoy the music, perhaps they could vary the music just a little. Other than that, I did find the objects alright, not very difficult, and like I mentioned, I thought the scenes were quite pretty and full, just needs some tweaking or something! Rated 4 out of 5 by Alee7383 from Give some credit When there is a new game I do read the reviews first to see just how the game was received. Altho, as in the reviews on this game were not favorable I still always play it myself to see if I agree. I don't believe the people who gave these reviews really looked at the game for what it is. Yes it is very simple HO, and yes some of the items were "fuzzy" as some stated. But the game was an "old fashion" HO from time past. The scenes were colorful, the story? I wouldn't call it a story but just a few girls visiting Hawaii. The timer was quick and if you consider yourself an "expert" player then it shouldn't have been a problem for you. At least this game wasn't "dark" as most of the games are on Big Fish. I myself didn't mind playing this game it was o.k. and should be given some credit. I personally like a change and like playing "old fashion" HO's, they should have more. You really want a challenge? Try the Lost Cases of Sherlock Holmes. Talk about small items and hard to find, to me an excellent HO. This Holiday Adventure game would be good for beginners....and medium players that are looking for a challenge to try and beat the timer...lol. 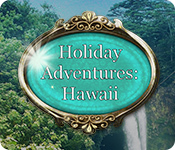 Rated 3 out of 5 by mendillovictoria from HOLIDAY ADVENTURE - HAWAII THIS WOULD BE GOOD FOR KIDS OR EVEN A BEGINNER.THERE ISNT MUCH OF A CHALLENGE. I WISH THERE BE BETTER THIS IS LIKE 4 OR 5 GAME OF THIS SERIES, WELL YOU DECIDE IF ITS GOOD FOR YOU GOOD LUCK. Rated 2 out of 5 by Eveoflove from Perhaps I'm too picky... Review based on trial only. The graphics are nice, but fairly beach-generic (at least during the time I played); the objects are clear, but the silhouettes are so-so. There is a timer but you can continue to play; you just don't get a time bonus; there is a bad-click penalty if you've reached a certain number of bad clicks within a scene (you lose 50 points for each bad click beyond that point); honestly, I didn't try to game to get a high score! I stopped playing when I had to find a candlestick that ended up being a light fixture on the wall with a light bulb in it! Try it; you might enjoy this HO-only game. There are too many better ones out there! 2 stars because fortunately the silhouettes are oriented the same way as the objects in the scene. Rated 2 out of 5 by splash1234 from Put some effort into these HO games!! There are times when an HO game is a nice change from all the HOPA games that come out. A nice way to relax but you might want to fix the graphics so its clear enough and the silhouettes are really hard to recognize. Use the imagination and do something different so we want to buy the game. Rated 2 out of 5 by grandmacathy from very basic I was able to finish 30% of the game in the demo. And I didn't try to go very quickly. 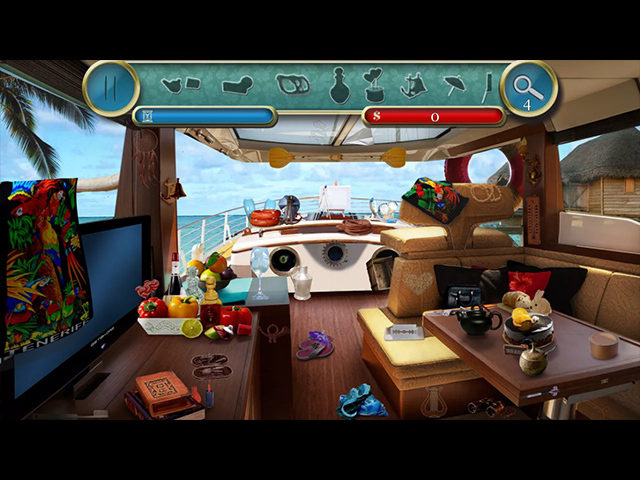 It is a very rudimentary Hidden Object game. It is strictly Hidden Object. In the hour demo, I did not encounter one other type of scene. I bet this game was developed as a school project. The 3 girls that are traveling with you in Hawaii are better off left at home. They are in the game to direct you to various scenes. Funny thing is though the scenes are repeated, so it doesn't make sense to have the girls travel around. 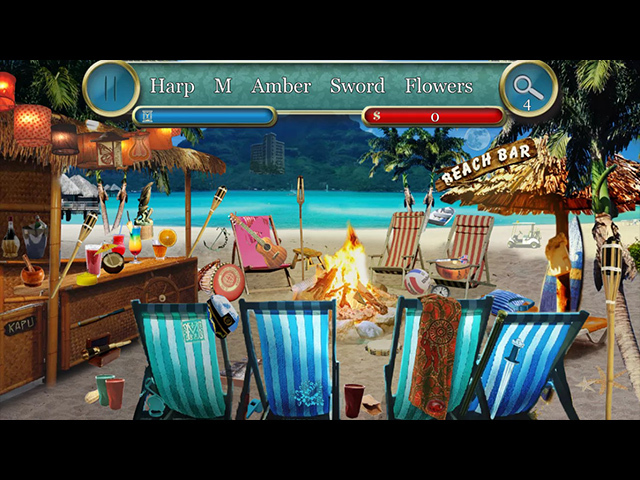 The Hidden Object scenes either have shadows (which are very poorly defined) or words to define the objects to find. They are mostly very easy; I used the hint a few times in the shadow scenes because the shadow was so generic it could have been a number of things and I was just not interested enough to look very hard. There are point penalties for too many wrong clicks (I think more than 3), so in the shadow scenes, you might as well use a hint. Some of the items could have 5 or 6 similar shapes, and you'll get penalized for trying to determine which one it is. Even the music became irritating after a while. It's worth the free trial to see if you want to buy it, but I would waste my money when there are so many other better Hidden Object games. Rated 2 out of 5 by CyndiLouWho2 from Simply hidden object; gets rather boring If you're a person who likes finding objects while a timer runs down ridiculously fast, then this game is for you. There is only one mode of play and that's it. You must play with the timer and if it runs down to nothing, you don't have to start over, but you get NO bonus points because you're too slow. Graphics are just okay with everything being hand drawn, which made it difficult sometimes to recognize items. Resolution is poor as well. Since it's one hidden object scene after another I found myself wandering off, thinking of other things. The music was decent, so I listened through my headphones which helped keep me awake. The story line, if you want to call it that, seems like it was written by a child. Conversation bubbles pop up next to the cut and pasted characters. In general, I'm not recommending this game because of it's subpar quality and lack of ingenuity. 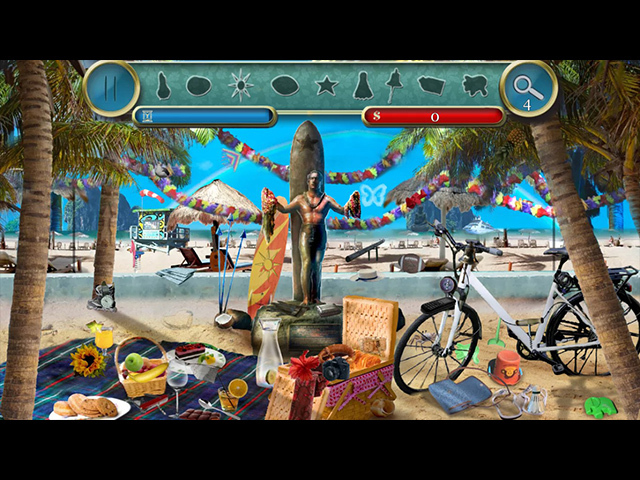 However, if you enjoy beating the clock by frantically finding hidden objects, then you just may like this game. Rated 1 out of 5 by debra52 from Stop with the hints already Most people know how to play these types of games. The never ending tips led me to delete this really fast. Need an option to stop the teaching mode!